Martin Bergman has done it. 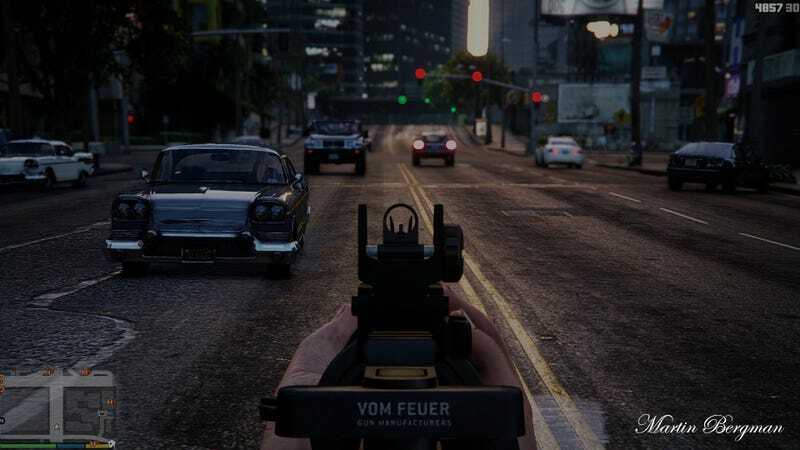 He’s released shots of a graphics mod for GTA V on PC that actually, and noticeably, improve the game’s visuals. That’s awesome! We get sent tweets and emails every week about mods like this, and when we check them out, most times it’s tough seeing any kind of changes or improvements at all outside a few model upgrades. Part of that must be down to how good the game looks by default, but it might also have just been a matter of time. He calls this the Toddyhancer mod, and it actually combines a few different things, like “Reshade Shaders, ENB series, simple tweaks and some tonemapping with class”. It’s still a work-in-progress (check back here for info on when it’s released), which would explain why the video below is choppy, but the screenshots are just gorgeous.